dumb parents = dumb kids that try to eat everything. And they are going to discontinue the manufacturing of handguns next?? What a joke. Perhaps drive-thru joints should stop serving HOT coffee so idiot customers don't burn themselves with it, too. I place partial blame on the insurance companies with desiring ever increasing profits. You see, they try to wrap us up in a protective bubble, yet still charge outrageous premiums. Apparently parenting isn't a thing anymore. Although I agree that the parents are responsible. Buckyballs isn't innocent either. Unlike Zen Magnets, they refer to their product as "toys" for "adults", and sold at places like brookstone and urban outfitters, on shelves next to other puzzles in reach of children. I never ATE my toys, when I was a kid. @ron, right!? me either. i think these kids are dumb or something.. gotta make the world safe for the idiots. LAWYERS,LAWYERS,LAWYERS...THEY MAKE THE WORST PRESIDENTS ALSO. As George Carlin said, "Whatever happened to natural selection; survival of the fittest? The kid who swallowed too many marbles doesn't grow up to have kids of his own." This should not have happened. KEEP THEM AWAY FROM YOUR CHILDREN! You're talking about the lawyers, right? Wow. Just wow. I've seen articles about 7 year olds getting into cars and driving them and wrecking. Should be ban the sale of all cars, too? It's the parents' responsibility to keep kids away from things that could harm them. This is ludicrous. gotta love those cons who take no responsibility. Just as silly as your post. Go back to bed Troll. Lol it is the truth! It is always someone else's fault. Oops bought a house I can't afford, its the fault of the evil mortgage banker who held a gun to my head and made me buy it. Government lent me thousands to pursue a worthless degree, it is the fault of the evil businesses for not employing more art history majors. Uh oh, my kid swallowed a bunch of metal balls because I was too stupid or lazy to take responsibility for them, its all the fault of the company who made. They should have made their little metal balls big enough you can't fit them in a human mouth!!! Please, this has nothing to do with left or right. Ser....you mean like the Republicans who started two unnecessary wars and gave hundreds of billions of dollars of tax cuts to millionaires and billionaires, and then left the next president to pick up the tab? Then attacked him for not paying it off in four years, when the Republican led House wouldn't let him pass any of the legislation that would attempt to fix it? Look in the mirror my friend (and watch Fox News for even five minutes), and you'll realize the conservatives are the kings of the "it's somebody else's fault" game. Do you have proof that the only children that have been affected are those of "lefties?" I'm a a"lefty" and I think banning this is ridiculous. small minded peasants. politics is a shell game. DrSmith, you make way too much sense. No one wants to hear facts, so take your truthful comments elsewhere! This is a blog, for Pete's sake – you're supposed to make up stuff as you go. DrSmith has been reading his mantra... problem is it only makes sense to people with no common sense. The real problem is the extremist don't have time to evaluate the falsehoods from the facts, and there are way too many extremist on both sides. Do your home work and join me in the middle, where common sense lives! Yep, and since we are into generalizing, How many children are killed or injured every year by conservatives that take no responsibility for their firearms? Hint, it is a LOT more than are injured by Buckyballs. Stupid parents give them to stupid kids who eat them and then hire stupid lawyers to defend their stupidity. Couldn't have said it more eloquently myself! 'Personal responsibility', particularly when it comes to parenting, is becoming a foreign concept in this country. Though the quote is misattributed to Twain, the sentiment is the same. I mean, jeez. How many kids have put saftey pins in their mouths over the years? Do we demand they stop making them? I bought a gas powered RC helicopter. My kid thought it looked cool, started it and lost both hands in the rotors. Now I am mad. All RC toys with moving parts should immediately be banned !! I fondling my buckyballs right now! I hope I don't loose my balls since they can never be replaced. We don't need children that swallow metal spheres. "The group released the results of a new survey of more than 1,700 doctors, who reported at least 480 toy magnet ingestions in the past decade, with 204 occurring in the past year." Really CPSC? You might as well try to get kitchen knives, swimming pools, and vehicles out of consumers' hands too...They're more dangerous...This is so dumb. Perhaps the solution is to administer IQ tests to all citizens. If all 'retards' were sterilized, over time self inflicted injuries due to stupidly would all but disappear. That was tried in the 20's and 30's. Didn't work. We still have stupid people. That was a stupid thing to say. Get in line, you're first. hmmm, good thinking. Hitler had the same idea. lets just kill away all our problems because we are too dumb to figure them out. Watch then go ballistic on ebay. I love how when people don't have the ability to take care of (and watch) the children they chose to have, the rest of us have to suffer. This is a "toy" for adults. If you can't keep your children away from them, maybe you shouldn't have children. I'm tired of having to pay the price of people that can't raise their children. It's called Darwinism. Stupid people, including children, kill themselves so they cannot pollute the genetic "ether" and weaken the collective chance for survival. Unfortunately, we are preventing that and will soon live in a world full of snookies and honey booboos. Yup, and we're actually rewarding them with millions of dollars so they can have more stupid kids and help sue and shut down more businesses. They should be hung for their anti-American actions! Don't worry public about educating your own children about not eating metallic balls, its the government's job to do this for you and keep you children safe from your stupidity and neglectful parenting. What ever happened to common sense and personal responsibility? The ever growing nanny state rears it's ugly head again! It's easier to let someone else think for you. I forgot how to wipe and am waiting for a government program to be created. I can remember when I was 6 or 7, I was eating a piece of butterscotch candy that went down my windpipe and I was given the Heimlich and had passed out for a few seconds. Last time I remember looking, butterscotch is still for sale. There are SO many items for sale that are the size of these things and could be choking hazards...and as in my example some of those things are GIVEN to kids. This is just an example of a company trying to get approval of their existence and relevance so they come up with nonsense court cases that just cost taxpayers money. I don't disagree with your post – personally responsibility and such. Just thought i'd point out the danger isn't a choking hazard, but rather the problem of ingesting magnets which can lodge themselves dangerously especially if ingested with other magnets metals etc. Just another reason why we need to limit the power of the Feds. This is absolutely stupid. So what next – ban magnets altogether? What about those alphabet letters with magnets on them... get rid of them! What about those magnets in the hw dept to help pick up nails... get rid of them too! STUPID STUPID STUPID! Sue the idiot parents who don't supervise their kids and buy something without reading the label! Now let's talk Lego and Crayons and all the surgies I know that have happened to remove those from tummies, intestines and noses! Let's get rid of everything in the stores that can be swallowed or pushed into an orafice of any kind just to make sure the kids don't get their hands on them! Disapointing. But not really too surprising. What do you expect when you live in a country where you can smoke a cigarette and then sue the cigarette company because you got sick from smoking it? And WIN! The federal government is our parent. It's utopia. We get to be provided for, protected, told what to do, and educated by the best and the brightest elite of the human race. The only thing they don't do for me is wipe my a$$. If I am getting the infant treatment, shouldn't I get the premier package? So why are BBs legal???? You can walk into any sporting good store and get them. Are idiot parents suing over those to? You have to wonder if some parents get their kids to eat this crap on purpose, so they can then launch a bunch of lawsuits. I can think of lots of little things that would fall into that category. It doesn't make sense why they would pick on a product that you almost only ever see in an office. Time to teach your dum^$%# kids that the magets aren't food. The government destroys jobs and business. So kids swallowed these because the adults ignored the warning labels??? Where is the parental accountability??? You can't ban every non food thing a kid can get into his mouth. "where is the parental accountability?" HAHAHAHAHAHAHAHA........it's a lot like unicorn hunting. Gotta love it when the government has to step in to "protect" us! Sew the kid's mouths shut. People in this country just refuse to take responsibility for their actions. The parents should be more careful that these don't fall into kids hands. I mean, after, all if you give a chimp a gun and the chimp shoots someone, you don't blame the chimp. Liberals would blame the gun manufacturer. Another reason why this country is going to end up like Europe... so sad. You mean the Europe where I can walk into any corner store and buy Kinder Eggs? Maybe its cold (and I am a father) but this just sounds like natural selection at work. Go Darwin! Lawyers don't understand this kind of thing because they are a man made problem. Only a conservative could see this an issue from the left... stupid is stupid right or left. Surely conservatives should understand stupid. I call B.S. This company is bankrupt and using this as an excuse. They were failing and going out of business anyway. Fact. Liberals are going to force their views on America, one way or the other. Watch out soda pop and hamburgers. You're next. It's time to take back control of this country from the lawyers. This was a VERY clearly labeled product with overwhelming public support (based on the comments posted here) – what right does the court system have to take it away? Throw out these ridiculous lawsuits and fine the people who waste the court's time by bringing them. The courts have no right to punish the general public because a few people are idiots. Ridiculous. How marbles do you think have been swallowed? And those are actually marketed to kids. Relying on people to read was the first error. Too bad. Too much government. I got me a pair. The US is still the only country where Kinder Surprise chocolate eggs ("Ue-Ei", with little toys or figures inside) get confiscated at the border (the ban is about 80 years old). How come countries like Canada or Germany don't have these issues? I don't think they have smarter kids, or do they? As an afterthought: maybe the manufacturer could just have used weaker magnets? How strong does a magnet have to be to pierce intestines? 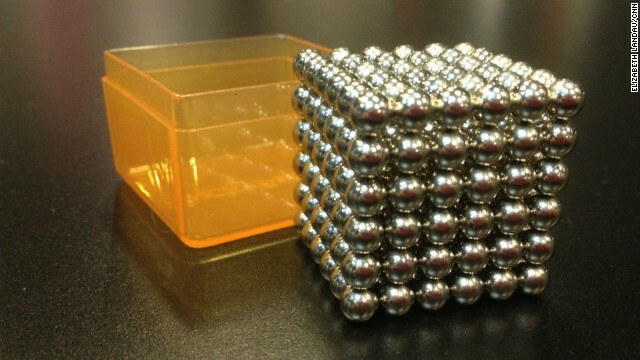 The strength of these magnets is why people bought buckyballs in the first place. Out of all the dangerous things in the world that children can swallow I can't believe we are going to put a BAN on small magnets. Kids under 2 will put anything and everything in their mouth. Poisonous, dangerous whatever. Keeping bad stuff out of their mouths is a full time job. I came home from work one day to find my 1 yr old boy happily munching down on an ashtray full of butts. With a big smile on his ash smeared face. I mean anything. I just have to ask – if you are so concerned about the childs safety, why in the heck are you letting ANYONE smoke around a 1-year old? Really? REALLY? Whatever happened to personal responsibility? This awesomeness gets shuffled off into oblivion because of bad bad parenting? To all those parents whose kids needed surgery for eating magnets, you should be ashamed of yourselves. We all agreed to wholesale-trade freedom for safety, and the govt is going to enforce that. Apparently parents are incapable of keeping their children away from their own adult "toys" so they have ruined it for all of us. This is an expensive toy. It's not as if it's just lying around. Don't take your kids to the office and let them play with your stapler and buckyballs to keep them occupied. What about guns? I would have to say more children are seriously injured and killed by legally owned guns in their own homes. I think this is a bigger issue than a "toy" that was ingested. No-one takes responsibility for their actions and are sooo quick to blame someone else for their lack of supervision or parenting skills. We all pay the price for someone that is out for a quick buck. I don't see how these "buckeyballs" expand? I didn't notice in the article if being magnetic is an issue or is it just because it's round and relatively small. I guess marbles, Ball and Jacks (if they still make them) and any board game with small game pieces will be asked to be removed from the toy store shelves. I'll start picking up any small stones in my yard as a proactive measure against being sued. The issue at hand is that the balls ARE magnetic. When more than one is swallowed..... well… I believe magnets attract. If these balls are swallowed at different times then the balls with find each other sooner or later. Attach to each other inside of the intestines and or stomach. This causes the intestines blood supply between the two balls to be cut off, causing necrosis and a hole in the intestine and or stomach. …. But the parents or the teenager are to blame ultimately. Not the company for making this ADULT product.